Dynamic deck-building leads to the best railway in Japan. 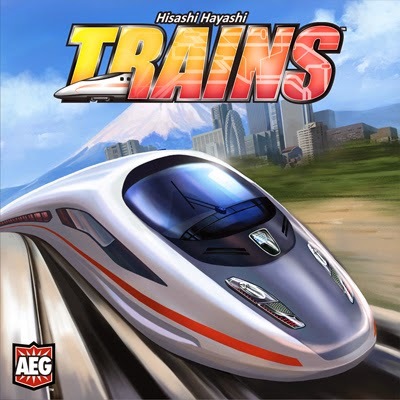 Trains is a deck-building game with a couple of interesting twists. Not only are players building a deck of cards, they are also building a network of rails and railway stations on the double-sided map board. Each player starts the game with 7 Normal Train cards, 2 Lay Rail cards, and 1 Station Expansion card. Normal Train cards have a monetary value and will be used to make purchases, Lay Rail cards build your rail network, and Station Expansion cards build stations which score victory points at game end. In every game there is a combination of standard cards and random cards available in a common area. The standard cards include additional Lay Rails and Station Expansions, Express Trains and Limited Express Trains – provide higher purchasing power, 3 types of Victory Points – Apartment, Tower, & Skyscraper, and a large stack of Waste – provides another game twist. There are 30 types of random cards from which 8 types will be chosen and added to the area with the standard cards. These other randomized cards provide various actions, additional money, and/or victory points. Waste cards just muddy up players decks and are acquired every time a rail is laid, a station is built, or a victory point card is purchased. While Waste is unavoidable there are cards in the random decks that if chosen can help manage your Waste. Minimizing the Waste build-up in your deck is essential and adds an additional layer of strategy to the game. I have played Trains several times. I really like the crisp artwork on the cards, the building of the network on the board and the challenge that the Waste cards bring to the game. 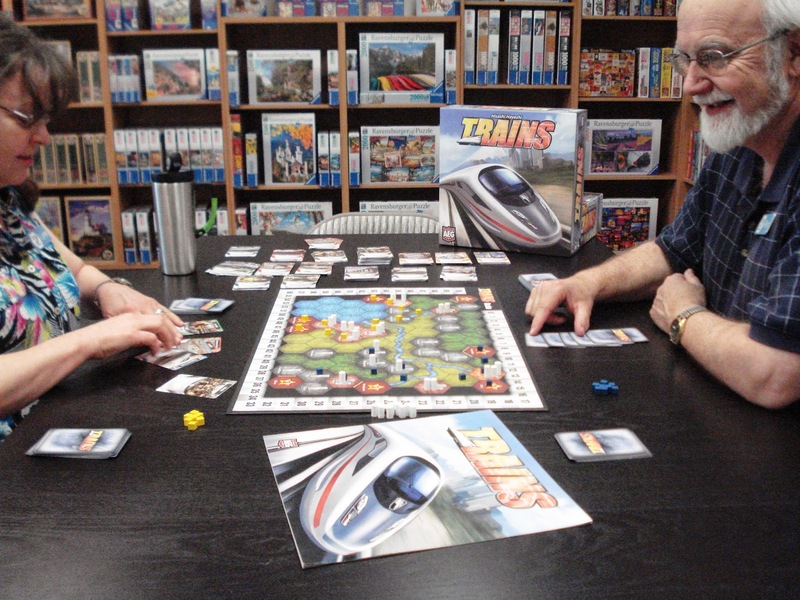 We have an open copy of Trains available in our Store Demo Games Library for you come in and try. Come and visit us at 30 NW 2nd Street in Historic Downtown Gresham. We have a full range of family games, strategy games, Euro-style games, war games, card games, dice games and more. Also for the puzzle enthusiasts we carry quality puzzles from Ravensburger, White Mountain, and Cobble Hill.